The 12 Ensemble and guest viola soloist Maxim Rysanov ﬁnd fresh voices in old sounds with music from Britten and Schubert, a new multimedia performance of Woolrich, plus a work from Tansy Davies. This programme explores how artists reach across generations to inﬂuence each other. Renaissance composer John Dowland’s impassioned Lachrimae provide the inspiration for Tansy Davies’s thrilling work Residuum, and Benjamin Britten’s own Lachrymae. Later, music, dance and ﬁlm collide in Ulysses Awakes, Woolrich’s 1998 paraphrase of Monteverdi, with a score performed live by the ensemble and featuring new choreography by Alexander Whitley. Schubert’s Death & The Maiden completes the evening, arranged here for string orchestra by another of the great Romantic composers, Gustav Mahler. Finding innovation in old ideas comes naturally to the 12 Ensemble. 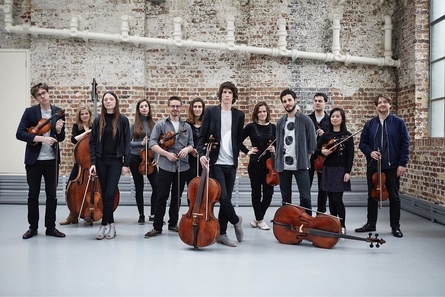 Founded by Eloisa-Fleur Thom (Principal Violin) and Max Ruisi (Principal Cello) in 2012, they have established a reputation for injecting youthful energy into the chamber music repertoire, whether they’re performing classic string orchestral works, or new works by Mica Levi or Sigur Rós. This concert is supported by Resonate, a PRS Foundation initiative in partnership with the Association of British Orchestras, BBC Radio 3 and Boltini Trust.